This secretive, hard-to-spot resident of Canada’s boreal forest is likely a descendant of the Eurasian lynx and resembles a very large domestic cat. It has a short tail, long legs, large feet and prominent ear tufts. Its winter coat is light grey and slightly mottled with long guard hairs; the under-fur is brownish, and the ear tufts and tip of the tail are black. The summer coat is much shorter than the winter coat and has a definite reddish-brown cast. The average weight of a lynx is 8 to 14 kilograms, measuring around 90 centimetres in length. The average lifespan is 15 to 20 years. Habitat: The lynx generally inhabits forested wilderness areas. It favours old growth boreal forests with a dense undercover of thickets and windfalls. However, this carnivore, or meat eater, will populate other types of habitat as long as they contain minimal forest cover and adequate numbers of prey, in particular snowshoe hares. Because hare populations increase in forests that are growing back after disruption by wildfires or logging operations, these regenerating forest ecosystems are often able to support denser populations of lynxes as well. As long as they are not disturbed, lynxes are remarkably tolerant of human settlement. For example, since the early 1960s, they have occupied the partly cleared mixed-farming district near Rochester, in central Alberta. A few were shot in farmyards, but there was no intensive fur trapping, and lynxes remain in the area. Diet: More than 75 percent of the lynx’s diet in winter is snowshoe hares, and when they are abundant a lynx may kill one hare every one or two days. In summer the lynx’s diet is more varied. But even in summer hares remain the main prey, supplemented by grouse, voles, mice, squirrels, and foxes. A hungry lynx will devour an entire hare in one meal. It may also hide partially eaten prey to finish later. When it is available, lynxes will also supplement their diet with carrion, or dead flesh, from domestic livestock and/or big game animals, such as deer, but they rarely attack large prey. Mating occurs during February or March each year, and the young (usually four) are born in April and May, 60 to 65 days later. Although the lynx seldom uses an underground den, young may be born under brush piles or uprooted trees, or in hollow logs, which provide shelter from rain and cold. The kittens, reared solely by the female, look like those of the domestic cat. 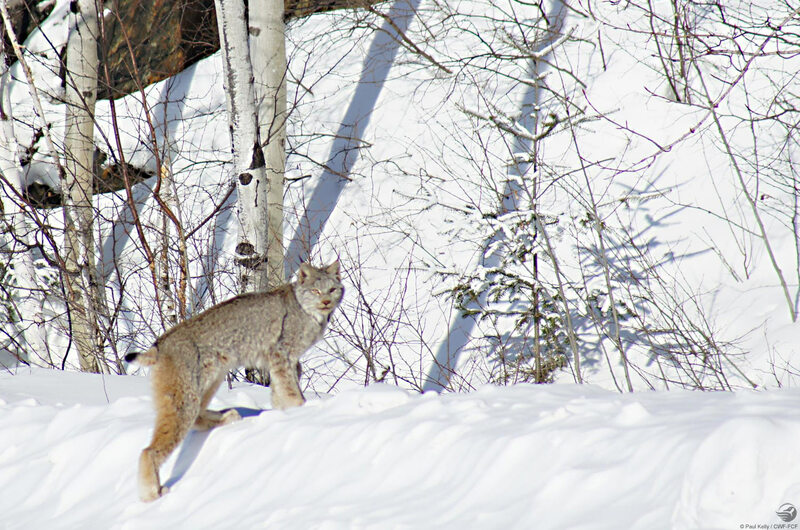 Female kits may breed for the first time as they approach one year of age, but this depends on the abundance and availability of snowshoe hares and the physical and nutritional condition of the lynx. 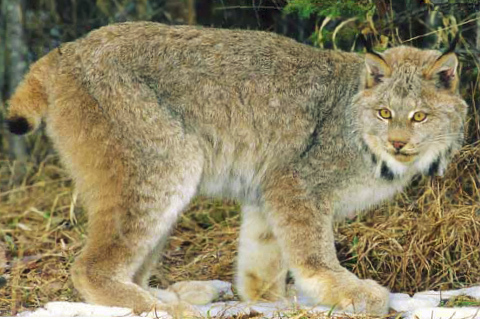 Notes: Lynx are listed as threatened in the contiguous United States, but the Canadian lynx population seems to be secure, although it undergoes periodic dramatic fluctuations tied directly to numbers of snowshoe hare, its main prey. The lynx can be distinguished from a bobcat by its larger body and feet, as well as its tail, which has a pronounced black tip. It favours old-growth boreal forests with a dense undercover of thickets and windfalls. The lynx has a variety of vocalizations, like those made by house cats, but louder. More than 75 per cent of the lynx’s diet in winter is snowshoe hares; when hares are abundant, a lynx may kill one every day or two. In summer, the lynx’s diet is more varied. Not an especially good runner except over short distances, the lynx stalks or ambushes its prey at close range and often at night. Mating occurs during February or March each year, and the young (usually four) are born in April and May. Human settlement does not seem to have reduced the lynx’s range.